The lingual artery originates just over the superior thyroid artery at the plane of the hyoid bone from the anterior surface of the external carotid artery, travels deep towards the hypoglossal nerve [XII] and goes among the middle constrictor and hyoglossus muscles. The lingual artery emerges through the anterior surface of the external carotid artery. Along with the lingual veins and the glossopharyngeal nerve, it travels in the middle of hyoglossus and the middle constrictor of the pharynx in order to get towards the floor of the mouth. At the anterior border of hyoglossus, the lingual artery turns sharply upwards. It is covered by the mucosa of the tongue and is located in the middle of genioglossus medially and the inferior longitudinal muscle laterally. It anastomoses with its contralateral equivalent near the tip of the tongue; within any surgical resection of the tongue this contribution is vital in sustaining the blood supply towards the tongue. A rich anastomotic network that supplies the musculature of the tongue as well as a very dense submucosal plexus is created by the branches of the lingual artery. The deep lingual artery or ranine artery is the concluding portion of the lingual artery after the sublingual artery is produced. Along the ventral surface of the tongue it travels superiorly in a twisted course, under the longitudinalis inferior and over the mucous membrane. It is located on the lateral part of the genioglossus that is the chief large extrinsic tongue muscle, escorted from the lingual nerve. While the lingual nerve goes superior towards it, the deep lingual artery travels inferior towards the hyoglossus. It is assumed to anastomose with the artery of the opposite side at the tip of the tongue. These vessels are placed one on either side of the frenulum lingae in the mouth. 1. The Sublingual Artery originates at the anterior margin of the hyoglossus as well as goes towards the sublingual gland straight in the middle of the genioglossus and mylohyoid muscle. The mylohyoideus and neighboring muscles. The mucous membrane of the mouth and gums. 3. 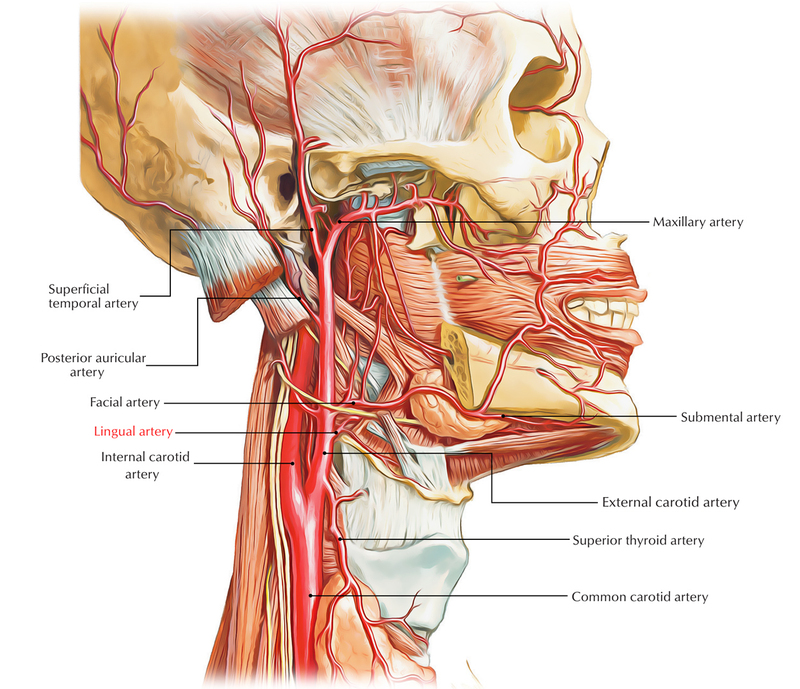 In order to anastomose with a similar artery from the other side, one branch travels at the back of the alveolar process of the mandible in the substance of the gum; another anastomoses with the submental branch of the facial artery as well as pierces the mylohyoideus. 1. The suprahyoid branch of the lingual artery while supplying oxygenated blood to the muscles attached to it and joining with its fellow of the opposite side travels together with the upper border of the hyoid bone. 2. Generally, the dorsal lingual branches of lingual artery comprise of two or three small branches which emerge under the hyoglossus.